Even small irregularities in your smile like chips and cracks can really drive your self-confidence down. 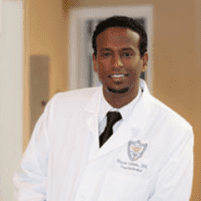 If you’re hesitant to smile these days due to cosmetic tooth damage, porcelain veneers provided by Mussie Sibhatu, DDS, MS, and the team at Laurel Smile Dentistry in Oakland, California, may be perfect for you. Use the online booking tool or call the office to schedule your appointment today. Veneers are small porcelain panels that cover the front of a damaged tooth. They’re generally considered a cosmetic treatment, but veneers do more than just beautify. Your new veneers can add strength and stability to your teeth, as well. Veneers can be a great way to enhance your smile while keeping your natural teeth intact. It usually takes a total of three visits to Laurel Smile Dentistry to get your new veneers. During the first visit, your dentist diagnoses your issues and discusses your concerns with you so you can plan treatment together. In the next visit, your dentist prepares your teeth for veneers. In this process, your dentist buffs your teeth lightly to take off about half a millimeter of enamel. This creates an ideal surface for your veneers to stick to. In the same visit, your dentist makes a mold of your teeth, and then sends that to the lab that makes your custom veneers. In your final visit, your dentist affixes the veneers to your teeth using a specialized chemicals and professional grade dental cement. Finally, the dentist uses laser light to harden the cement rapidly. You may notice some minor changes after your new veneers are in place, but they'll feel normal very quickly. Your Laurel Smile Dentistry dentist will give you some tips and tricks regarding veneer care. In general, it’s incredibly easy and won’t take much extra time at all. To best preserve your veneers long-term, use a soft-bristle toothbrush and use gentle motions when using dental floss. With good care, your veneers can last for many years. How do veneers compare to cosmetic bonding? Veneers and cosmetic bonding are used for most of the same reasons, but they’re quite different. The cosmetic bonding material can stain while veneers are highly stain-resistant. Cosmetic bonding can last for 3-10 years, but veneers can last longer. Cost-wise, cosmetic bonding is cheaper than veneers. Your dentist can help you decide which is best for your situation. Use the online appointment maker or call Laurel Smile Dentistry to schedule your veneers consultation today.